Linking physical activity away from an exergame or other non-mobile connected device has been a scenario that has not been explored but holds plenty of promise. As Zamzee's recent findings, having an accelerometer and access to a social network where rewards are given out based on activity levels showed a significant increase (60%) in PA than the control group that did not have access to the website. 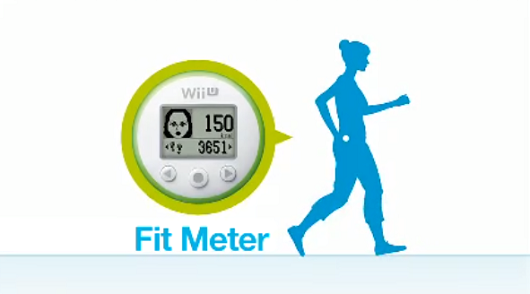 Using a new pedometer dubbed the Fit Meter (see Pokewalker for DS), Nintendo will be releasing Wii Fit U in 2013. 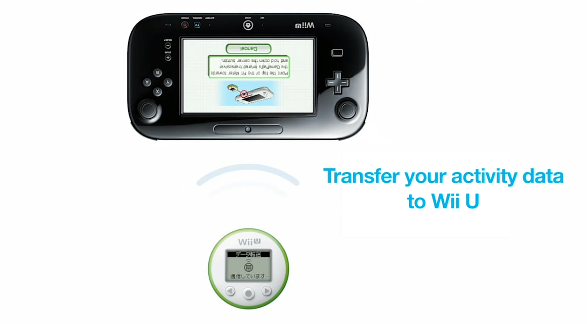 If the device looks familiar, it should and it appears it will interface with the Wii U controller via infrared sensors like the Pokewalker did with the DS. Will U Buy It? Drawing from Higgins's self-discrepancy theory and regulatory focus theory, this study examined the use of activated selves and regulatory foci in health games. Utilizing the Wii's® avatar-creating and exergaming features, a 2 (activated self: actual self versus ideal self) × 2 (regulatory focus: promotion versus prevention) × 2 (efficacy appeals: self-efficacy versus response-efficacy) between-subjects experiment tested the interactions of activated selves, regulatory foci, and efficacy appeals on low-calorie dieting intentions after health game playing. Results from an experiment with 156 participants demonstrated that a fit between regulatory focus and efficacy appeals induced greater dieting intentions when the actual self was activated while the opposite effect occurred when the ideal self was activated. Theoretical contributions to basic and applied social psychology as well as managerial implications for consumer behavior research are considered. Can a Fit Video Game Avatar Make You Healthier? A couple of weeks ago I defended my dissertation titled: "Comparing MVPA, Duration, EE, RPE & Enjoyment of Adolescents Playing Exergames". I would like to thank everyone who has been so helpful and instrumental in getting me to this point, especially my Committee Chair Dr. Melissa Bopp; Committee Members: Dr. Linda Caldwell, Dr. R. Scott Kretchmar, Dr. Karl Newell; and Dr. John Challis (former Grad Coordinator) all of Penn State University; PSU & SUNY Cortland Faculty and Staff; the Cortland YMCA staff and participants, and of course my wonderful and loving family. Some of the details have been omitted as the separate papers are in the process of being submitted to separate journals but it gives you a rough estimate of what I was investigating. If you have any questions please feel free to contact me. Can patients with early-stage Parkinson's Disease improve scores on a functional reach test before and after exergame intervention training? Mendes and colleagues (2012) were interested in answering this question using Wii Fit as the intervention tool. I haven't see the entire paper yet but from the abstract it looks like some of the results are mixed. It appears that some of the cognitive demands of the game (attention, response inhibition, working memory) interfered and contributed to learning deficits; however, exergame trained patients were able to transfer exergame-related motor skills to a similar untrained task. 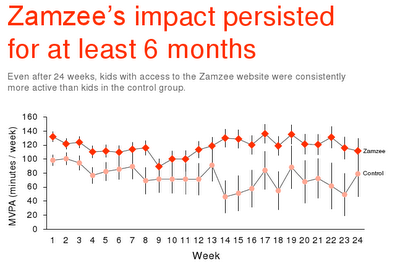 Kids who got access to the Zamzee website moved 59% more on average than kids in the control group, who did not get access to the website. I guess that answers the questions to whether or not a device and access to a new website could get kids to move more. 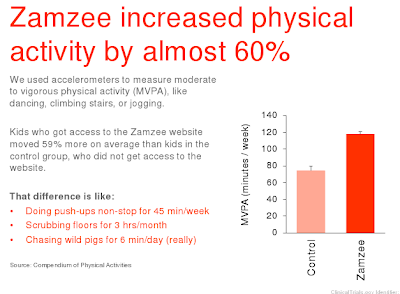 As you've already read, kids who received the Zamzee accelerometer and had access to an innovative website, increased their moderate to vigorous physical activity (MVPA) 59% above the control group that only received the Zamzee. 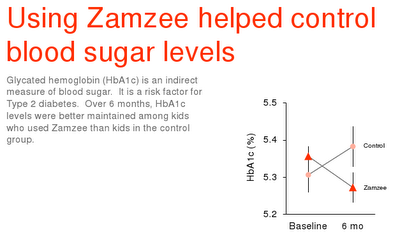 Below is a picture I took at the 2011 GFH conference where they provided us an update on Zamzee's product development and trial early results. Besides the great news about the increase in MVPA, and other biological markers - I think its great that the Zamzee group achieved CDC-recommended 60 min MVPA/day at a rate 4.5 times that of controls. My only question is the statistic the use (3.1% ± 0.3% of days vs. 0.7% ± 0.4%; p < .0001) sounds quite low - should it be days and not percent (3.1 ± 0.3 days vs. 0.7 ± 0.4; p < .0001)? Kudos to HopeLab, their partners, and all the participants for such encouraging results about how to improve the health of young people. 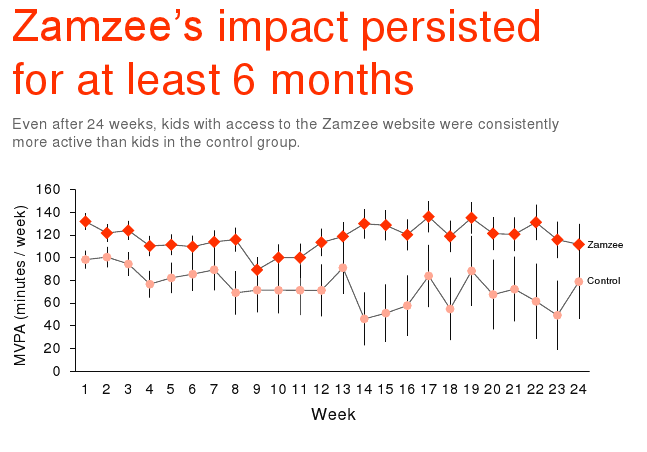 This presentation will report results from the Zamzee Impact Trial – a randomized controlled trial of the Zamzee accelerometer /motivational website system in 448 11-14-year-old adolescents recruited from 6 urban, suburban, and rural US middle schools. 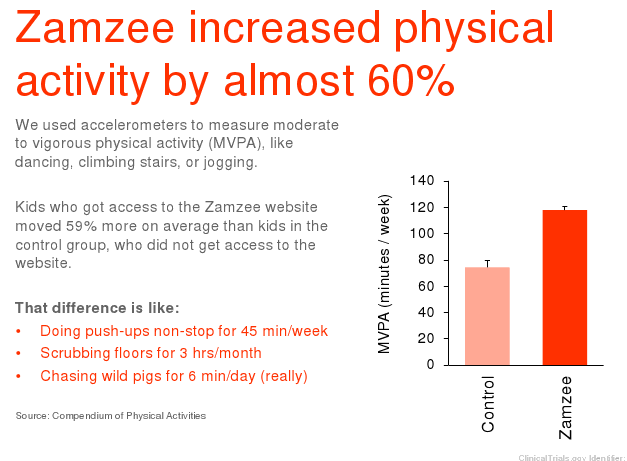 Zamzee combines individualized feedback, progress monitoring and goal setting, tangible incentives, and intrinsic motivation features to promote long-term increase in physical activity as measured by a 3-axis accelerometer system with automated upload to a central database. In this study, control participants received Zamzee activity monitors that uploaded data but had no access to the motivational intervention website. 186 individuals enrolled in a biomarker sub-study involving pre- and post-study blood sampling. Primary outcomes were accelerometer-based measures of weekly moderate-to-vigorous physical activity (MVPA) assessed continuously over 6 months. Compared to controls, the Zamzee group showed an average 59% higher rate of MVPA (mean = 118 min/week ± SE 3 vs. 74 ± 5 for controls; p < .0001) throughout the 6-onth study, with no decrement in difference over time (no Group x Week interaction, p = .9415). These effects correspond to approximately 1,120 min MVPA and 8,800 kcal expended per participant over 6 months. 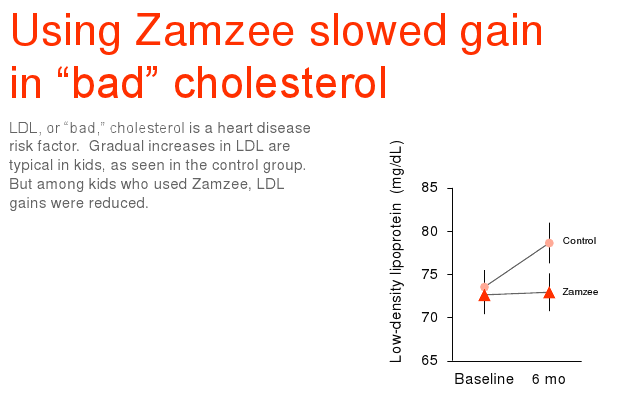 The Zamzee group achieved CDC-recommended 60 min MVPA/day at a rate 4.5 times that of controls (3.1% ± 0.3% of days vs. 0.7% ± 0.4%; p < .0001). 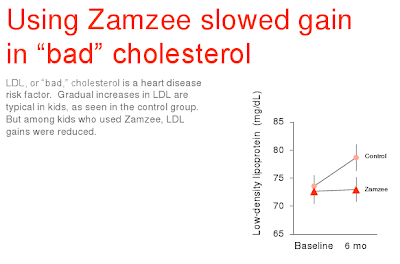 Within the biomarker sub-study, the Zamzee group showed more favorable pre- to post-study changes in LDL cholesterol (+0.3 ± 1.4 mg/dL vs. +5.1 ±1.6; p = .034), total cholesterol (+0.2 ± 1.5 mg/dL vs. +4.7 ± 1.7; p = .057), and, in protocol-adherent participants, HbA1c (-0.08% ± 0.03% vs. +0.08% ± 0.05%; p = .012). Non-significant effects were observed for CRP (-0.01 ± 0.06 mg/L vs. +0.53 ± 0.06; p = .322) and BMI (+0.34 ± 0.07 kg/m2 vs. +0.37 ±0.06; p = .781). 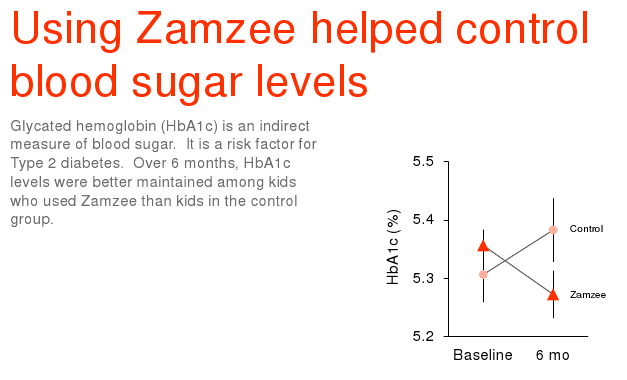 The Zamzee activity meter/motivational website system can consistently increase MVPA over 6 months in middle school-aged children, with favorable effects on blood lipid and metabolic parameters. 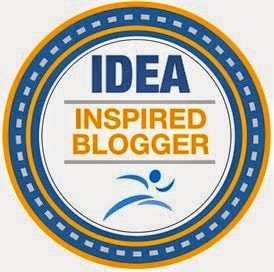 HopeLab is a non-profit organization founded in 2001 by Board Chair Pam Omidyar. HopeLab harnesses the power and appeal of technology to improve the health of young people. HopeLab applies a research-based, customer-focused development model to create products that positively impact health behavior. HopeLab is part of the Omidyar Group philanthropic enterprises. For more information, please visit http://www.hopelab.org. Which games did they play in Wii Fit? Were there 2 separate groups or was it a multiple baseline-design? Although the changes may not have been statistically significant, were they clinical significant? Were the changes over time compared to a traditional treatment group? What assurances were there to mimic traditional tasks with the Wii Fit activities? Was the total amount of time in therapy exactly the same as a traditional 3-week regiment? During a typical treatment period of 3 weeks, what would typically be the level of improvment occurring in patients. Its interesting that they tested the children on running when for the most part there is no running feature in Wii Fit except for Free Run. Objective: To study the impact of training using the Nintendo Wii Fit in 14 children with spastic hemiplegic cerebral palsy. Methods: A single-subject single blinded design with multiple subjects and baselines was utilised. Interactive video gaming (IVG) in lieu of regular physiotherapy was given for 3 weeks. Outcome measures included modified balance and running speed and agility (RSA) scales of the Bruininks-Oserestky test of Motor Performance 2 and the timed up and down stairs (TUDS). Results: Balances score improved significantly (F(2, 26) = 9.8286, p = 0.001). Changes over time in the RSA (F(2, 26) = 0.86198, p = 0.434) and the TUDS (F(2, 26) = 1.3862, p = 0.268) were not significant. 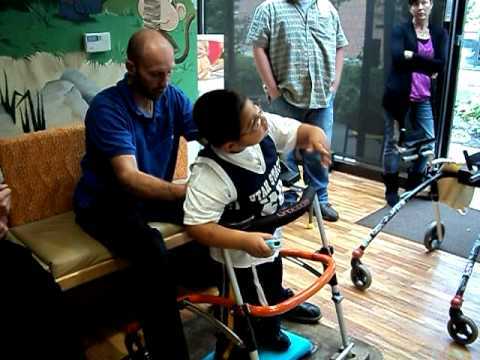 Ten children preferred the intervention to conventional physiotherapy. Conclusion: Most children preferred the IVG but as the effect did not carry over into function, IVG should not be used in place of conventional therapy and further research is needed into its use as an adjunct to therapy. Kinect for Xbox 360 and NFL PLAY 60 have teamed up to combat childhood obesity and inspire a healthier generation of kids. We're challenging kids of all ages across the nation to get their whole body in the game for 60 minutes every day. You and your friends can help us reach our goal of inspiring 60 Million Minutes of active play this season. Pass the word along about the 60 Million Minutes Challenge today! I wonder if they'll take in points and minutes from PlayFit on Xbox Live? I think its great the NFL and Xbox are sponsoring this drive, but why aren't schools, states, provinces, and parents demanding more physical activity and PE in schools? How will this data be tracked? Via Facebook, self-report, activity monitors? Check back on October 9th for exciting updates and to pledge your support. Sometimes my work at Microsoft takes an interesting turn. The other day my colleagues in our Interactive Entertainment Business asked if I would help them promote a campaign to fight childhood obesity. The physician in me jumped at the opportunity. After all, according to the Centers for Disease Control, about one third of all children and teens in the United States now fall into the category of being overweight or obese. That is triple the number since I first started practicing medicine in the early 1980’s. And the consequences of so many young people being fat at an early age cannot be ignored. Overweight children are very likely to be overweight adults. With that comes a range of chronic illnesses and disabilities like high blood pressure, type 2 diabetes, joint problems, increased risk of stroke and heart disease, and even increased risk for some kinds of cancer. Today we are kicking off a campaign called the Xbox 360 “60 Million Minutes Challenge”. The objective is to get 1 million kids to pledge that they will play at least 60 minutes each day between now and Super Bowl Sunday on February 3rd. The campaign joins a wider effort initiated by the National Football League called NFL Play 60.Of course the idea is to get kids more active no matter how they play, but getting in the game with Xbox 360 and Kinect is one such way. If you’ve ever watched kids (and adults) playing with Xbox 360 using Kinect you know what I mean. Kinect for Xbox 360 features controller-free gaming where you use your whole body to play and offers a natural and interactive way for kids to get off the couch - kicking, jumping, and running in place.The official spokesperson for the NFL Play 60 campaign and our 60 Million Minutes Challenge is the greatest receiver in football history, Jerry Rice. Rice says, “To reverse the trend of childhood obesity, we need to continue to educate kids and parents about the importance of 60 minutes of daily activity. That's what's great about Kinect for Xbox 360. It gets kids off the couch and gets their whole body in the game. Being a healthy kid can lead to being a healthy adult." 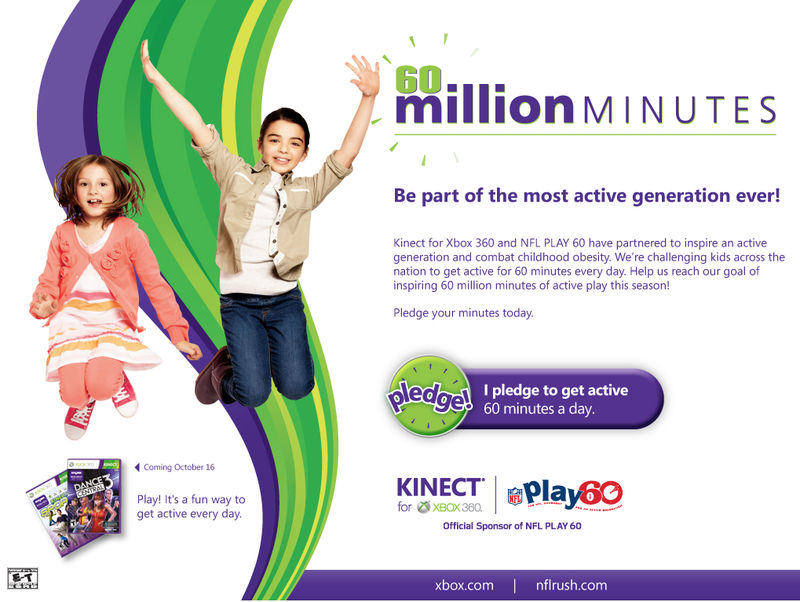 Created in the spirit of NFL PLAY 60, which encourages kids to get 60 minutes of physical activity daily, the Kinect for Xbox 360 “60 Million Minutes Challenge” is a season-long nationwide movement. 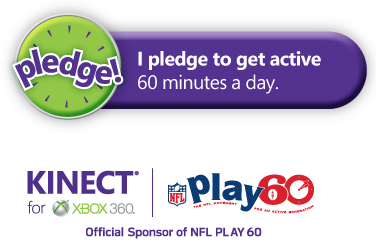 From now through Super Bowl XLVII, kids and families can pledge to PLAY 60 at www.Xbox60MillionMinutes.com or online on the Xbox Live dashboard. Those who register their pledge on LIVE can enter for a chance to win NFLShop.com gift cards. On Oct. 9, 2012, the “60 Million Minutes Challenge” Facebook tab will go live and those who pledge via Facebook will have a chance to win a personalized “Social Autograph” on their Facebook wall from a host of current and former NFL stars. You can learn more about the 60 Million Minutes challenge and what both Jerry Rice and I have to say about the benefits of getting kids active by following this link. Imagine being able to monitor ECGs in realtime on your physician's phone. That's what this device offers and is just the start of medical informatics integration. I would love to see more monitoring systems for schools to track daily physical activity as well as intensity across heart rate zones, calories burned, calories consumed, workout plans and emotion/psychological levels. Its funny that we put more emphasis into tracking daily attendance (do you know of students who have perfect attendance? ), Math/History/English/Science grades (Common Core) than we do about physical fitness, physical activity, nutrition, stress and emotional levels. When is this going to change? Just days after reporting on a study done in Montreal (25% of Youth Exergame! Do You? (Study)) our Games for Health colleague Dr. Monique Simons and her team are reporting on the prevalence of exergaming in Dutch adolescents. they found that on average, adolescents played about 80 (+/- 136) minutes a week of exergames which is lower than the figures I collected a few years ago (25 mintues/day); but its still great to see all these figures from different countries. I love this final line from the abstract "According to the adolescents, active gaming mainly replaces sedentary screen time such as TV viewing, internet and non-active gaming. Parental opinions concurred with this appraisal." Now this is what we've been looking for in terms of exergames displacing traditional sedentary activities. 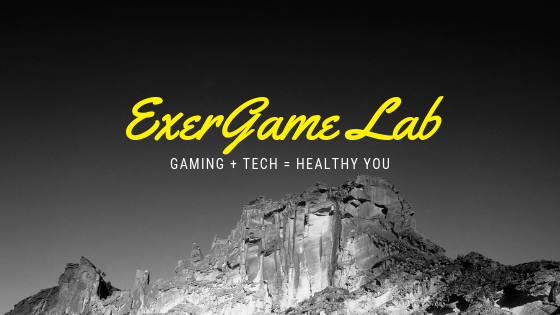 Will the displacement of sedentary activities continue as games become more complex and exhausting? Will enjoyment and skill development in exergames translate to better self-efficacy and lead to trying and maintaining of other fitness activities - Exergame Gateway Effect? The actual sample size was relatively small for a national sample of regular exergamers (n=65) it'd be interesting to see what games they play regularly because we all know there are so many different games that elicit different intensities. 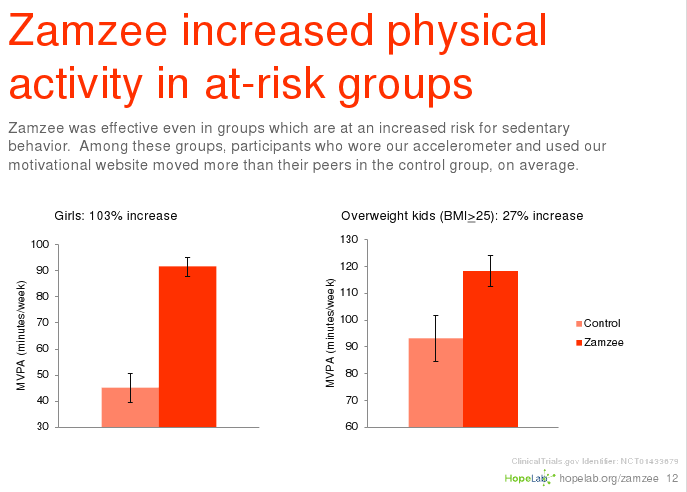 Adequate levels of physical activity are part of a healthy lifestyle and in this way linked to better health outcomes. For children and adolescents, the physical activity guideline recommends at least 60 minutes of moderate-to-vigorous physical activity every day. However, many adolescents are not physically active enough and they spend a lot of their time on sedentary activities (such as video games). A new generation of video games that require body movements to play them, so-called "active games", could serve to increase physical activity in adolescents. The activity level while playing these games is comparable to light-to-moderate intensity physical activity. The current study aims to increase our understanding of 1) the demographic characteristics of adolescents who play active games regularly (3 1 hour per week) and non-regularly (>= 1 hour per week), 2) time spent on active games, 3) the contribution of active games to daily physical activity and 4) the type and amount of activities being replaced by active gaming. A cross-sectional survey was conducted in a Dutch internet panel, questioning adolescents in conjunction with one of their parents. A random sample of 320 households (with stratification on gender of the parent and the adolescent, the age of the adolescent and the region of the household) was selected that owned a console or application for active video games and that had a child aged 12 through 16 years. 201 child--parent couples (63% response) completed an internet survey with questions about demographics, physical activity and sedentary behaviour, and gaming behaviour. The questionnaire also contained questions designed to assess whether and how active gaming replaces other activities. Besides descriptive analyses, independent t-test, Pearson's chi-square and Mann--Whitney test (when data were not normally distributed) were used for comparisons between regular and non-regular active gamers. Eleven percent of the adolescents with an active game in their household never used the game. 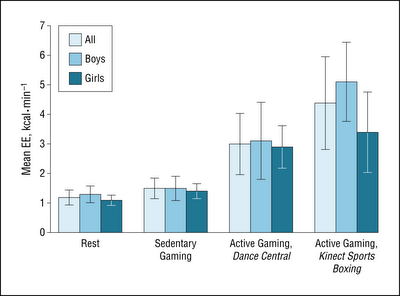 There were no significant differences in gender, education level (of adolescent and parent), ethnicity and sedentary behaviour between regular (n = 65) and non-regular active gamers (n = 114). Adolescents' (regular and non-regular active gamers) meantime spent on active gaming was 80 (+/- 136) minutes a week; this potentially amounts to 11% of total physical activity. When time spent on active gaming was included in the calculation of the percentage of adolescents that met the physical activity guideline, the percentage increased significantly (p < 0.05) from 67 to 73%. According to the adolescents, active gaming mainly replaces sedentary screen time such as TV viewing, internet and non-active gaming. Parental opinions concurred with this appraisal. 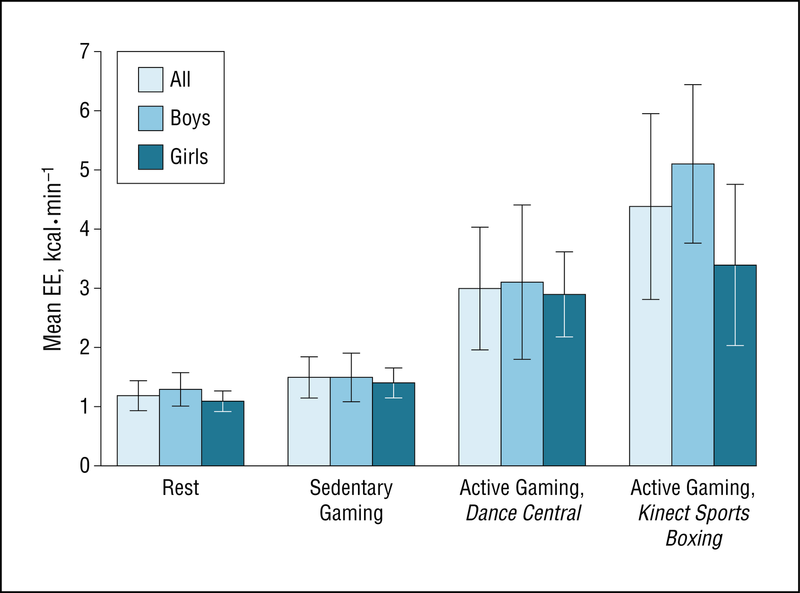 The results of this study confirm the idea that active gaming may contribute to an active lifestyle in adolescents, primarily because it potentially contributes substantially to time spent on physical activity. Secondly, active gamers indicate that they spent time on active games which they would have spent otherwise on less active activities. Can playing (or observing) exergames like Kinect or Wii improve your mood and make it more likely for you to exercise in the future? Those are the questions Drs. Chater and Marsden asked in the recent presentation in Liverpool. They found that those who played positively increased their mood, and in their beliefs about how much control they had in doing more exercise in the future. This makes sense as in most games, they are usually fun to watch and play and plus if you know that you're getting a good workout while you're having fun, it is likely to improve your mood and future intention to exercise. I've found similar things in my research with teenagers,children, and college students. Which Wii and Kinect games did they play? Were they experienced in either of them? Could prior experience and skill have affected the results? Were they monitored for exercise intensity of perceived exertion? Were they assessed for level of fitness or level of daily physical activity? Background: This study aimed to assess whether the Theory of Planned Behaviour (TPB) can predict physical activity (PA) intentions and whether PA is influenced by mood and past behaviour. 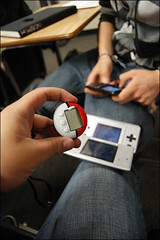 It further looked at the effect of physically active game consoles on these variables. Method: The study employed a randomized, repeated-measures design with 120 participants (40 per cent males; Mean age = 29.03; [SD=12.25]). The TPB variables (attitude, subjective norm and perceived behavioural control: PBC), past behaviour and PA importance were measured along with mood using the PANAS-X. The Nintendo Wii (Tennis – competitive game) and Microsoft Xbox-Kinect (Adventures – team game) consoles were used as the intervention tools. Findings: Multiple regression confirmed the TPB to be a strong model in predicting PA intentions explaining 58 per cent of the variance with behavioural importance explaining 18 per cent. MANCOVA revealed significant intervention effects, with an increase in PA intentions , PBC and positive affect and a significant reduction in negative affect after the intervention. Actual game play enhanced these variables more so than observing others playing the consoles. The type of game (competitive vs team) and console played (Wii vs Kinect) had no significant effect. Discussion: This study provides further support for the efficacy of the TPB in predicting physical activity intentions. Moreover, it confirms that engaging in PA through a games console can encourage beliefs in behavioural control, along with mood and motivation to be physically active, supporting their use in this setting. Future interventions should take this evidence into consideration. If you thought yes, "you are correct Sir!" 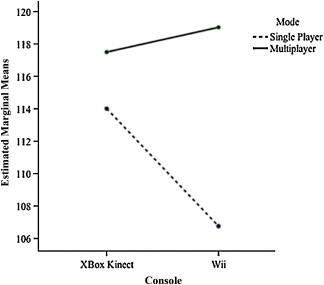 According to the current study, playing Xbox Kinect™ Reflex Ridge resulted in a 1 MET higher rating than Wii Sports Boxing, and playing multiplayer yielded a 0.5 MET increase compared to solo play. Exergames have the potential to provide a novel physical activity choice for adolescents that increases energy expenditure and elicit cardiovascular responses related to health (Graf, Pratt, Hester, Short, 2009, Lanningham-Foster, Jensen, Foster, Redmond et al, 2009, Mellecker, McManus, 2008, Murphy et al. 2009). 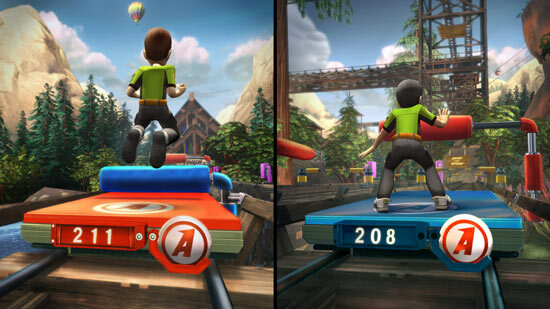 Should they have played the same versions of games on both Wii and Kinect to make a better comparison? They should have played Kinect Sports Boxing to make an easier comparison. I wonder what co-playing results would look like. It has been reported that a higher galvanic skin response is seen when playing video games against another human player than when playing alone, which suggests increased effort. The objectives of this study were to compare energy expenditure when playing two popular active video game consoles, and to compare energy expenditure when playing in single and multiplayer modes. Crossover trial with randomised playing order. ParticipantsFourteen healthy adults with a mean age of 21 [standard deviation (SD) 3] years. Methods and interventionsEnergy expenditure was measured using an indirect calorimeter at rest, during 10 minutes of play on Xbox Kinect™ Reflex Ridge in both single and multiplayer modes, and during 10 minutes of play on Wii™ Sports Boxing in both single and multiplayer modes. Metabolic equivalents (METs), heart rate, oxygen consumption and kilocalories expended. The energy expenditure during all gaming conditions was of a light intensity. Playing on the Xbox Kinect elicited greater energy expenditure than playing on the Wii [mean difference = 0.9 METs, 95% confidence interval (CI) 0.2 to 1.5]. Playing games in multiplayer mode led to greater energy expenditure (mean difference = 0.5 METs, 95% CI 0.1 to 0.9) and heart rate (mean difference = 7.9 beats/minute, 95% CI 2.0 to 13.8) than playing in single player mode. 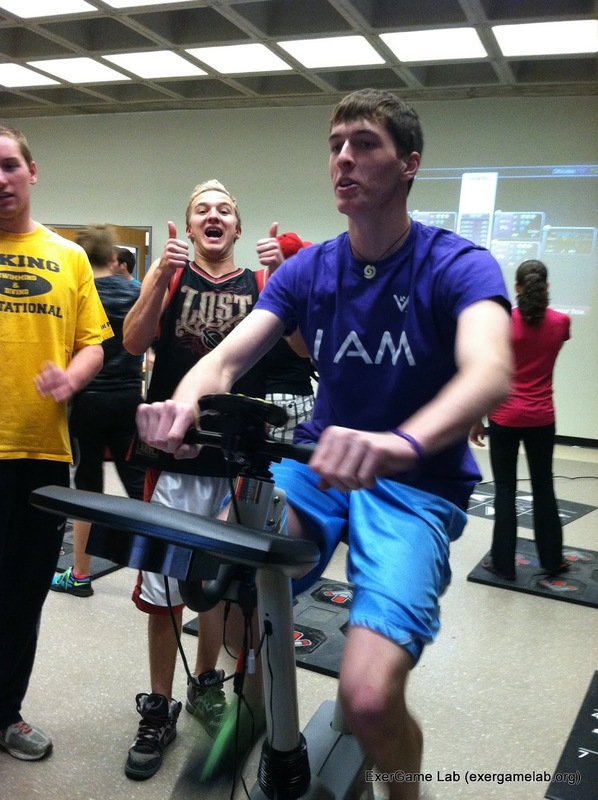 No gaming condition required moderate-intensity activity in this group of young healthy adults. Potential explanations for the difference in energy expenditure seen between consoles and modes are discussed. Using the latest in exergaming equipment including the Kinect sensor, we have the ability to free the game player up from holding any game controllers and move more naturally. Smallwood and colleagues had children play two Kinect games (Sports Boxing and Dance Central) for 15 minutes. As expected, Boxing was more strenuous than Dance Central but unlike other studies, the intensities were only of moderate and light intensities respectively. What was the RPE was for each condition? What (if any) did the children prefer? Did they have prior experience in playing these games or using Kinect? Objective To evaluate the physiologic responses and energy expenditure of active video gaming using Kinect for the Xbox 360. Setting Kirkby Sports College Centre for Learning, Liverpool, England. Participants Eighteen schoolchildren (10 boys and 8 girls) aged 11 to 15 years. Main Exposure A comparison of a traditional sedentary video game and 2 Kinect activity-promoting video games, Dance Central and Kinect Sports Boxing, each played for 15 minutes. Physiologic responses and energy expenditure were measured using a metabolic analyzer. Main Outcome Measures Heart rate, oxygen uptake, and energy expenditure. Results Heart rate, oxygen uptake, and energy expenditure were considerably higher (P < .05) during activity-promoting video game play compared with rest and sedentary video game play. 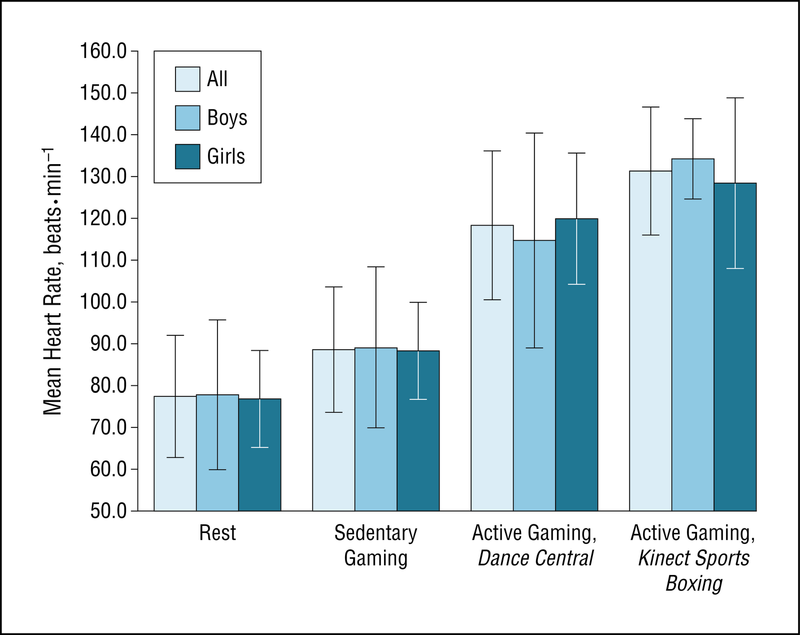 The mean (SD) corresponding oxygen uptake values for the sedentary, dance, and boxing video games were 6.1 (1.3), 12.8 (3.3), and 17.7 (5.1) mL · min–1 · kg–1, respectively. Energy expenditures were 1.5 (0.3), 3.0 (1.0), and 4.4 (1.6) kcal · min–1, respectively. 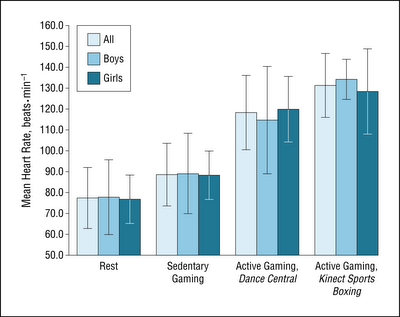 Conclusions Dance Central and Kinect Sports Boxing increased energy expenditure by 150% and 263%, respectively, above resting values and were 103% and 194% higher than traditional video gaming. This equates to an increased energy expenditure of up to 172 kcal · h–1 compared with traditional sedentary video game play. Played regularly, active gaming using Kinect for the Xbox 360 could prove to be an effective means for increasing physical activity and energy expenditure in children. Getting more active has never been easier with active play video games (exergames) and this demo of the upcoming Dragon Ball Z: Total Body Workout is no exception. I thought a few screen shots of the action would capture some of the movements required to play. Watch the video on Kotaku to get a sense of the pace of the actual game. Most of the movements seem to be upper-body and upper-limb focused and a couple spots where a jump was required. I thought there might be kicking required (given the game character threw a couple of kicks), but it doesn't look like it.